What type of indoor table do you need - conversion top, mini, novelty or full size? In this six-part series of pages we're looking at how to choose a table tennis table that's exactly right for YOU. 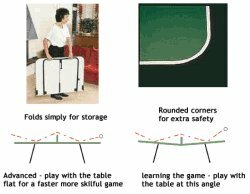 In part one we looked at the size dimensions of a table tennis table, how much room you need to play and how your table will be used, and then in part two we looked at whether an indoor or outdoor table tennis table would be more suitable for your needs. Want to buy a table? See my recommendations here. Well, let's now take a look at the different types of indoor tables which are available and determine which type of table will be best for YOU. 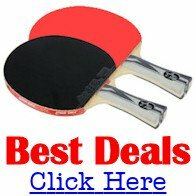 Before you decide which table to buy, you'll need to decide whether you really need a regular, full sized table tennis table, or whether a smaller one would be more suitable for you. You see, there are many different tables to choose from including - conversion tops, mini tables, novelty tables and even table tennis tables that you can use in your swimming pool. If you want a table at home but don't have enough space to store a regular table, you could consider getting a conversion top kit. This type of table consists of just a top surface section which fits over a pool table or other suitable surface. The main benefits are that it's ready for you to use in an instant and when you're not using it you can easily store it away. They usually include rubber or foam padding underneath to protect your pool table and connectors that keep the two halves of the playing surface together. A net is often included too. This type of kit can be considerably less expensive than a regular table, but as you would expect, the table surface will not be premium quality. However these conversion tops are worth considering if you play infrequently, or if you don't have sufficent space to store a regular table. They're also great for family get-togethers and inpromptu competitions with your buddies. If you've got young kids who are just starting to play the game and they're just playing at home for fun, there are a number of different mini tables and other sized tables available. The mini tables are great for kids because they have a setting which enables you to tilt the table top slightly inwards which helps them to have a rally with their opponent. They're also very easy to store away when they're not being used because they're small and compact. But one of the best features of these tables is that they're not as high as a regular table, so your kids won't have to reach up and over the table in order to hit the ball. There are also many other tables available at varying sizes - from ½ size to ¾ size - and they can be used wherever you have restricted space. 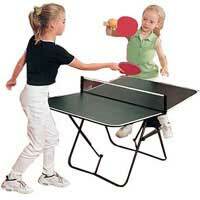 You'll also find full sized tables which have adjustable legs in order to lower the playing height of the table. These are great for young kids too. The telescopic legs can be adjusted to different positions and they can usually make the height of the table either 2ft (61cm), 2ft 3" (69cm) or 2ft 6" (77cm). I remember when I started playing at age 11, I couldn't reach the ball if my opponent played it close to the net and I always had to go around the side of the table to retrieve the ball, so this table would have been great for me. Or how about trying one of these novelty tables like this one I have. It's only 12 inches (30cm) long, 8 inches (20cm) wide and 2 inches (5cm) high. You also get two rackets and a ball. They're quite tricky to use, but great fun! I remember watching an exhibition match in the 1980s between Frenchmen Jacques Secretin (1976 European Singles Champion and former World Ranked number 2) and Vincent Purkart (2 times French National Singles Champion) where they used about four different sizes of table. They started a rally on a full sized table, had an argument with the umpire (all pre-arranged of course) and then transferred onto progressively smaller and smaller tables. You can also buy these novelty tables to use in your swimming pool. It's quite an art to use these, but they can be great fun for a party get-together. The table top is 54 x 27 inches (137cm x 68cm) and floats on the water. It has a hard top surface but soft sides to make it safe for other pool users. It comes supplied with oversized floating rackets, net and balls. 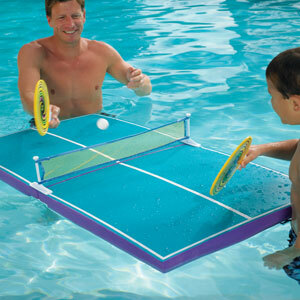 You can also use it as a tabletop game outside the pool, whether on the patio or in the house. 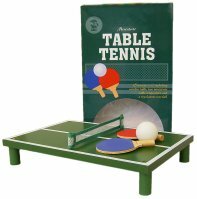 However, a full sized table is the obvious best choice if you're serious about playing this great sport of table tennis. These are the most widely available size of table and are the official size of 9 feet (2.74m) long, 5 feet (1.525m) wide and 2 feet 6 inches (76cm) high. But, before you buy a table there are a number of other items you'll also need to consider. Part 4 - What type of table tennis table undercarriage is best for you?